In Australia, 90% of the garlic we eat is imported. Yet we have around 15 different garlic varieties available to grow that don’t need to be biofumigated with chemicals, like methyl bromide that have been banned here for domestic use. Garlic is SO good for us … but not when it’s treated with chemicals. For health, amazing flavour + pest management in your garden. Safe food = avoid imported garlic – it’s cheap for a reason. Save money – organic garlic averages A$35-45/kg. It’s SO easy to grow, so there’s no excuse! Garlic is a bulbous perennial herb but grown as an annual. OK – it IS slow growing (avg 6-8 months). But it’s NOT a bed hog like pumpkins and doesn’t take up much ‘personal space.’ So I’m happy to dedicate about 1m2 to grow garlic to feed my family for an entire year. It’s a member of the Allium (onion) family – all space savers! Garlic is a staple ingredient in my kitchen all year round – for health and flavour! In 2011, I didn’t get the chance to plant in Autumn. 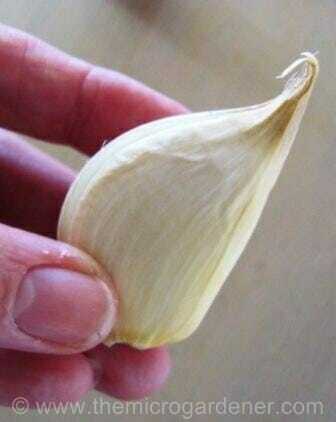 So I sowed a stack of soft neck garlic I had left in my fridge on 25 August (late winter). I harvested it exactly 3 months later on 25 November. This was a wonderful discovery! Even though I had technically planted at the ‘wrong time’ of year, I found a garlic variety that grows well in my climate. In a speedy 3 month period, rather than waiting an average 6 months! So experiment in your climate zone. I harvested about 40 bulbs. At current prices/kg, this harvest would have cost me $80+ … money back in my pocket! The photo above shows the difference in harvest results by sowing my garlic at different times of the moon cycle. After preparing my soil, I sowed 100 bulbs of garlic during the phase of the moon most suitable for planting root vegetables. Just two days later, ALL cloves were sprouting! That’s right – 100% germination. In the same soil right next to these cloves, I sowed another 20 cloves. Just two days later but NOT in the same moon phase. This was a dormant phase of the month when plants do the least amount of growing. This is a time of rest and low energy. 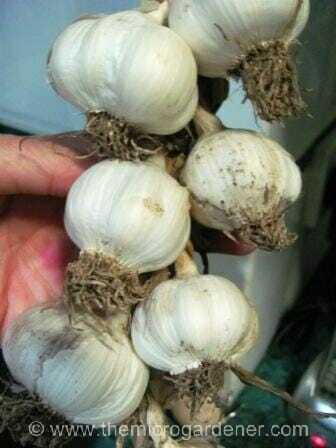 As you can see, these garlic bulbs from the first 100 harvest were perfectly formed and large for their variety. The difference was astounding. It took over a month for those 20 cloves to sprout, even though I sowed them only 2 days later! Even more interesting was they were straggly plants that never caught up in size or harvest yield. As you can see in the first photo, the bulbs had very small cloves and the outer protective paper wrapping didn’t form properly. Their storage life was minimal so these cloves had to be eaten quickly. The 100 larger bulbs were harvested just 3 months from the date of planting. Whereas, the 20 poor quality garlic plants took nearly 5 months before they could be harvested. When I did, they were a massive disappointment. Nothing worse than waiting months for your garlic, giving up valuable garden space and having a disaster! If you have a short growing season for garlic, timing can make a HUGE difference to your yields. 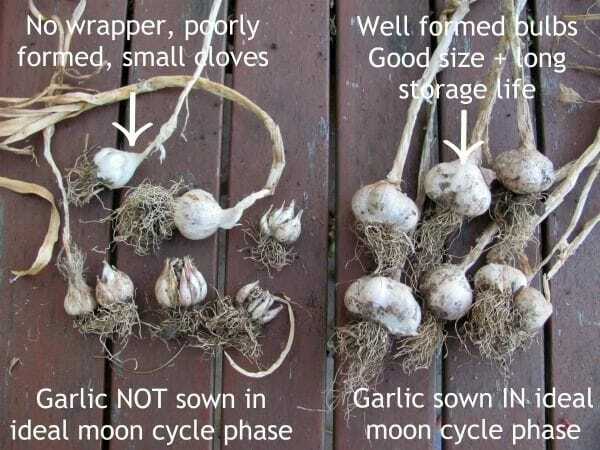 I always harvest garlic in the correct moon cycle to increase bulb storage life. The only difference was timing and planting by the moon. That’s why I get excited about working with nature’s moon cycle and sharing my experiences with you! The results speak for themselves. I hope you’ll try this simple technique to get a better garlic crop. Garlic doesn’t grow from seed but from mature bulbs separated into cloves. Soft neck varieties braid and store well. They usually produce 12-13 cloves/head but have no flower stem and suit warm climates with mild winters. One of the best varieties for our subtropical Queensland zone is ‘Glen Large’. I’ve also grown ‘Early Italian Purple’ and ‘Italian Pink’ successfully as well as a few others. Hard neck garlic types send up a hard, flowering stem. So these varieties are less suitable for braiding. They are milder tasting, but have a shorter shelf life. This is because they have less layers of skin around the bulb. Elephant or Russian garlic is not a true garlic. This kind of garlic is also known as a bulbing leek and has a milder flavour. Select varieties that grow well in your local climate zone. 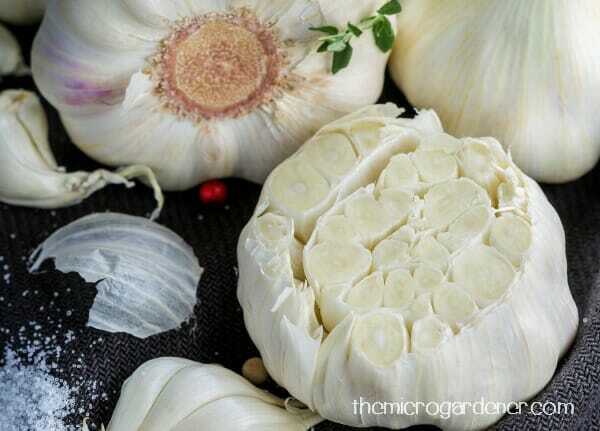 Try different varieties of garlic that suit your climate. Early and late plantings help stagger the harvest. Source locally grown organic garlic from organic growers and shops, online and farmers markets if you can. If that’s not possible, then look for heirloom and non-GMO varieties suited to your climate online. 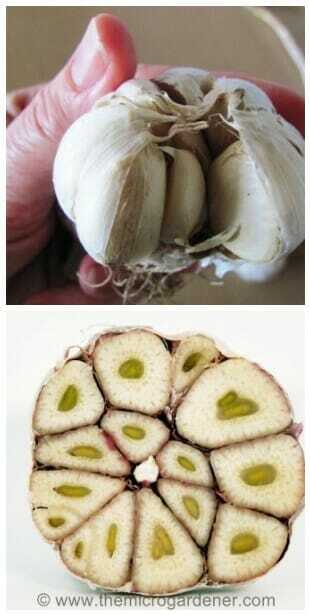 If buying garlic from a store, choose your bulbs carefully. Pick the largest garlic bulbs you can find. The size of the cloves you plant will determine whether you get big or small heads when you harvest. Use the smallest internal cloves (those less than 1 gram in weight) for cooking rather than planting. If you’re planting garlic from bulbs you have harvested last season, save your larger ones for this year’s crop. Make sure there are no signs of disease, marks or soft spots. Quality matters! Count roughly how many cloves/bulb to determine how many bulbs you need to buy for planting. How many? How much do you eat?! We eat a lot of garlic. So I plant enough to have at least one bulb every week of the year (52 + a few extras as a buffer). Each clove grows 1 bulb. On average I plant 100-120/year. That gives me some to eat, save for next season and sell. Plan ahead for when you want to grow garlic. Chill garlic cloves in the fridge for a few weeks before planting. This improves bulb development. You can skip this step but it helps grow bigger garlic. To prevent rotting in the soil, here’s a little tip: soak your cloves in a glass jar with equal quantities of baking soda to organic liquid seaweed for 2 hours. e.g. for 8-10 cloves (1 average bulb) = 1 tblspn baking soda: 1 tblspn seaweed. Increase quantity depending on number of cloves you’re planting. 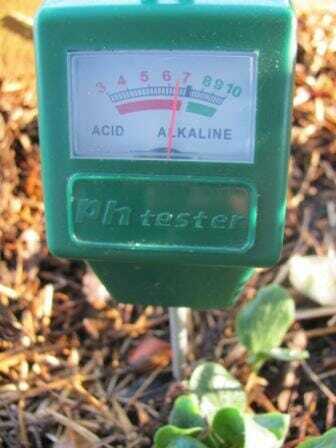 Soil test with a pH tester or kit. Garlic prefers soil with a pH 6.5 – 7.0. If you need to raise your soil pH, consider adding dolomite or agricultural lime. Likes: Full sun position; well-drained, humus-rich soil (add worm castings, homemade compost, humus, well rotted manure or blood & bone) plus a balance of nutrients (I use a complete organic fertiliser that includes rock minerals). Because garlic is a hungry root crop, the soil needs to be light and fluffy. So turn it over gently if needed and mix your fertiliser in well first. Alternatively make your own nutrient-rich potting mix like I do and grow in containers. 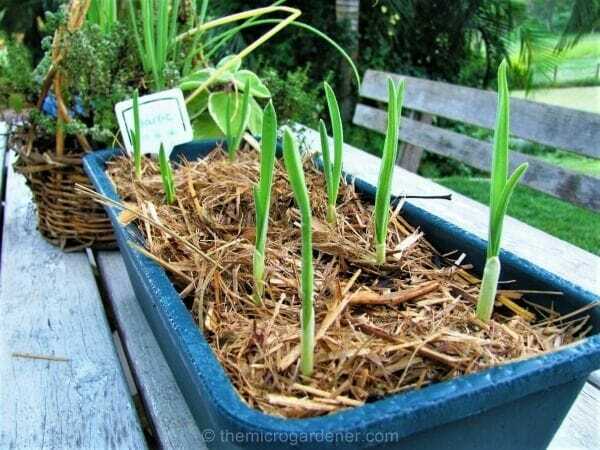 If you have limited space, grow garlic in shallow pots in nutrient-rich potting mix, like I do! 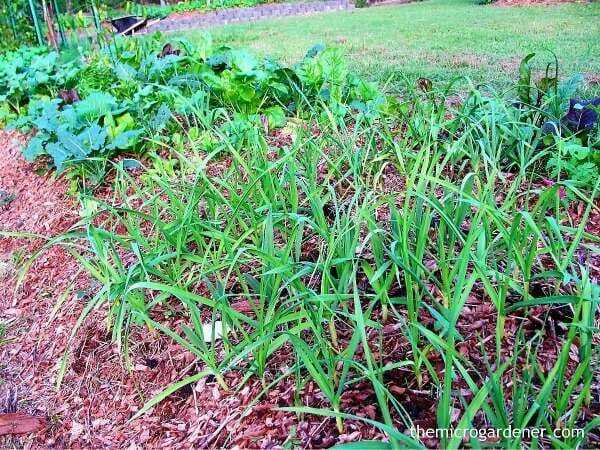 Garlic LOVES mulch to prevent weeds, provide protection, maintain soil moisture and keep soil cool longer. Dislikes: Too dry (when young), too wet or freezing. The colder your winter, the deeper your mulch should be. I add about 8cm (3.5-4″) here in the sub-tropics, but very cold areas could need 10-15cm (4-6″). Companion Planting: Garlic helps improve the health and growth of other plants including raspberries, beetroot, strawberries, tomatoes, lettuce, summer savoury and roses. On the flip side, never plant garlic near peas or beans. I’ve seen this in practice (even with chives and spring onions near bean plants). They just won’t be friends as they compete, so don’t waste your time and money! Garlic is a member of the Allium family (onions, leeks, chives, shallots) so companion planting rules apply to all those family members. Location: Good crop rotation practices help prevent diseases so avoid planting garlic where you’ve grown members of the Allium family in the last couple of years. If you have to reuse a pot, add fresh potting mix. Timing: Ideally during autumn. [See the Benefits of Moon Gardening to learn more about sowing crops at the optimum time each month and using a Moon Calendar]. 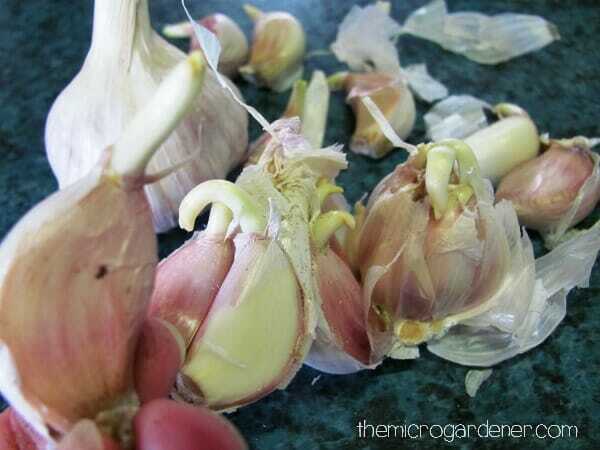 Separate the garlic head into individual cloves just before planting. Largest cloves will be around the outside and are ideal for planting. Small inner cloves can be used for cooking. If garlic cloves are sprouting they’re ready for planting! Be gentle to avoid bruising the garlic. Cuts and bruises can provide entry points for rot to set in. Sowing: Make a hole with your finger or the handle of your trowel roughly twice the depth of the clove (about 5cm/2in) and 10cm/4in apart. Plant each clove with the pointed end facing upwards. Press down very firmly as you back fill with soil (to avoid the cloves being pushed out after a few days as the roots start to develop). Check at this stage and reposition them back into line! Water in well with liquid seaweed. When the shoots are about 5cm/2in high, add mulch thickly to suppress weeds. Distance between rows: 30cm/12in. 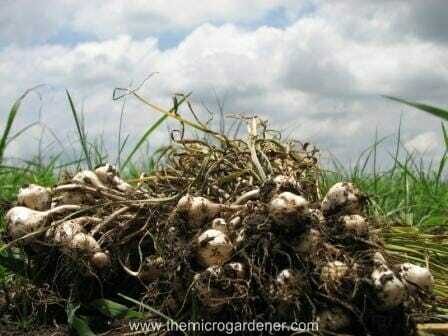 Yields: 1m2/3ft2 can produce 52 garlic bulbs – one for every week of the year. You can grow a lot of garlic in a small space – perfect for urban gardens. 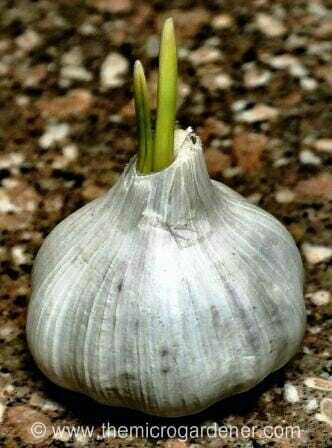 Container planting: Garlic grows 40-60cm/15-24in high depending on the variety and although you may not get as large bulbs in a pot, they are most definitely worth growing. As they are a long growing crop, interplant with fast growing lettuces and leafy greens around the outside. Pot depth should be at least 15cm/6in. The new shoots will appear and when they are about 15cm tall, it’s time to fertilise again with liquid nutrients. Every 2 weeks, I use seaweed or fish emulsion + a slurp of molasses in a watering can. Or sometimes I water in with worm juice (liquid from my worm farm) or compost tea. A sprinkle of worm castings or compost and minerals under the mulch can also help boost soil nutrition. Alternating their liquid diet seems to keep my garlic babies happy. In between, water regularly (unless it rains) until the plant flowers (for hard neck varieties). Or about 1 month before harvest (soft neck). This allows bulbs to dry out and harden. I maintain adequate soil moisture of 40-50% by checking every so often with a moisture meter. Soil should be moist, NOT wet. Most importantly keep weeds at bay. Garlic has a big appetite and doesn’t like competition! 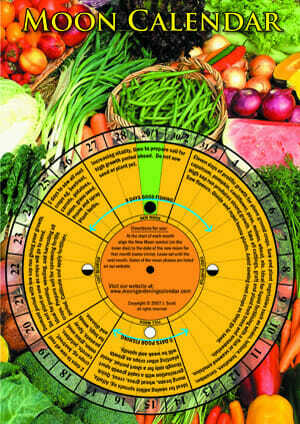 Keep a record of when you plant so you know the time your garlic variety is likely to mature. 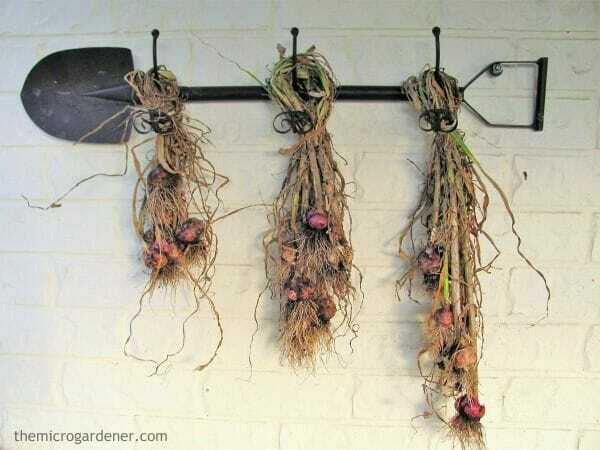 Avoid watering before harvesting so the bulbs are dry. Nothing worse than pulling muddy bulbs! You have a window of opportunity to harvest. Too soon and it will look like an onion (the segments and papery wrapper will not yet be formed). 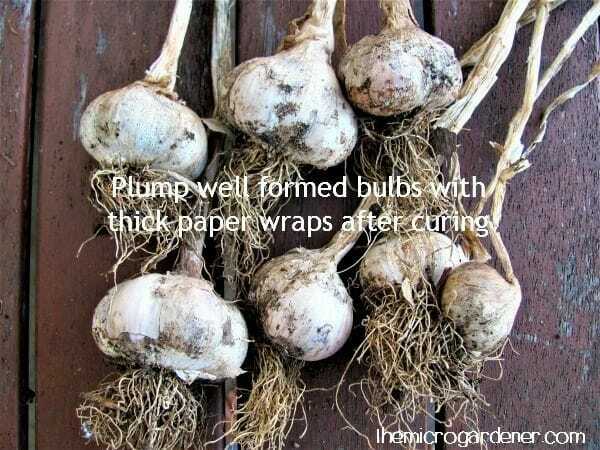 Too late and the cloves will grow and expand so much the outer tissue paper-like wrapper will split, which will reduce bulb quality and storage life. As a guideline, harvest hard neck garlic when roughly 1/3 – 1/2 the leaves are brown and wilted. Harvest soft neck varieties when the bottom few leaves start dying off or the garlic falls over. If you’re not sure, pull out one bulb to test it is fully formed before harvesting the whole crop. Your bulbs may be different sizes depending on the variety and when they were planted. Dig or gently pull up the whole plant. I don’t recommend using a garden fork or you can accidentally spear your bulb, like I did the first time! Watch out for earthworms that love to party around the roots. Don’t be tempted to wash it at this stage. Dirt is GOOD! Leave it be – you can gently brush off the excess with a toothbrush after it’s cured. Leave a few garlic heads in the soil rather than harvesting them all at this stage. When they start to produce little green shoots, you can plant the cloves individually for your next crop. They’ll start to grow quickly as they already have roots. If you need flavour before your garlic is fully grown, you can still harvest immature garlic bulbs. They’ll look more like leeks! 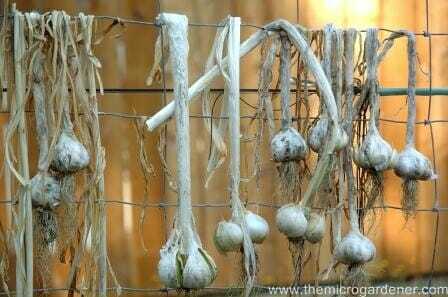 To cure your garlic so it stores well, hang in a dry, airy place in the shade or on racks. Dry the bulbs for a couple of weeks (up to 4 weeks or even longer as needed in cool zones). When to store garlic: Your garlic will be ready for storage when the bulb is papery and crinkled. This is one telltale sign you need to look for. Well cured skins will harden enough with a protective outer papery wrapper to store for 6-7 months. 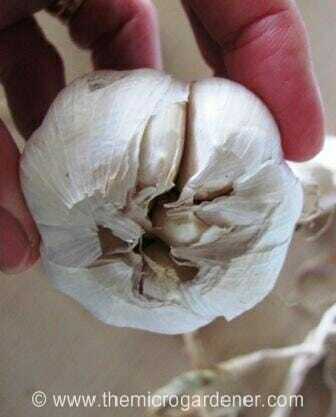 Hang garlic: When your garlic bulbs are fully dried, press hard. If there’s no resistance, you are ready to store the garlic. 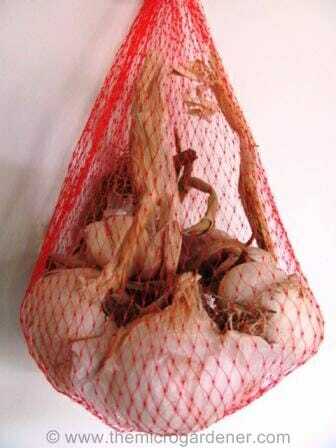 Store garlic in a recycled onion bag. It’s cheap and easy! Haircut: If you are going to plait your garlic, leave the leaves on. Otherwise, trim the leaf tops approximately 2.5cm/1in above the bulb and snip the roots off. I had so much fun with this project. I prefer my garlic braids that showed a bit more plait than the bunched one and these were easier to manage because there was a little space between each bulb and it shows off the leaves as well as the garlic! Freeze: Place individual cloves in a freezer bag or air tight container. Remove as much air as possible, seal and label with the date. Store for up to 3 months. You can freeze garlic cooked or raw to use later. 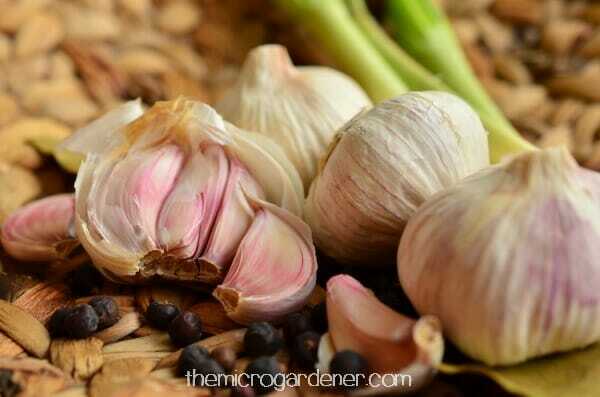 Whole cloves will retain their full flavour but chopped/minced raw garlic will start to develop allicin. This active ingredient is what makes it taste hot. So releasing it will give your garlic a more mellow taste. Just use a little more in the recipe if you choose to freeze, to make up for the less potent flavour when you defrost. Freeze minced garlic in an ice cube tray for convenient portions. Store in a garlic keeper or open weave basket. Don’t store garlic near humidity or steam. This can reduce the storage life or your garlic bulbs. You can store garlic in the fridge. However, this will reduce the flavour of your gorgeous garlic. Putting it in plastic or airtight containers can produce mouldy, rotted or sprouting garlic! Hard neck garlic varieties produce flower stems (‘scapes’) that form heads with bulbils. 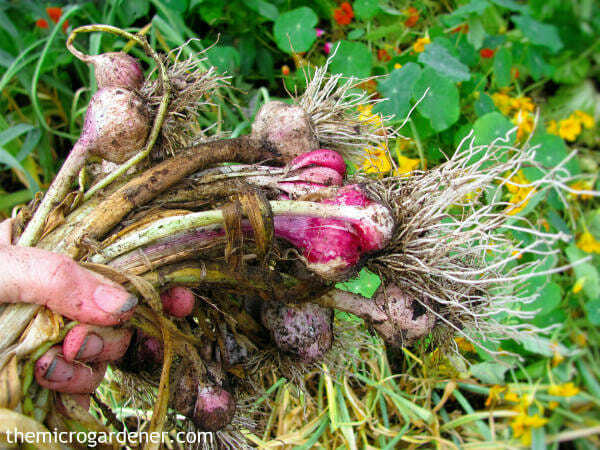 Prune these scapes off as soon as they appear, so the plant puts its energy into producing a larger garlic bulb. Use the scapes as cut flowers or chop up into bite-size pieces and substitute for onions or garlic in recipes! 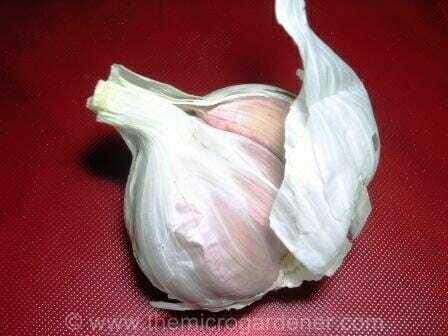 Grow garlic under roses to deter aphids. Ensure soil is moist for newly planted garlic, so roots develop. Avoid over watering and ensure good soil drainage to prevent cloves rotting. If you have a problem it’s likely to be due to lack of soil preparation, management during growing, incorrect pH, choosing the wrong variety for your zone or planting at the wrong time. I hope you’ve enjoyed learning how to grow garlic. 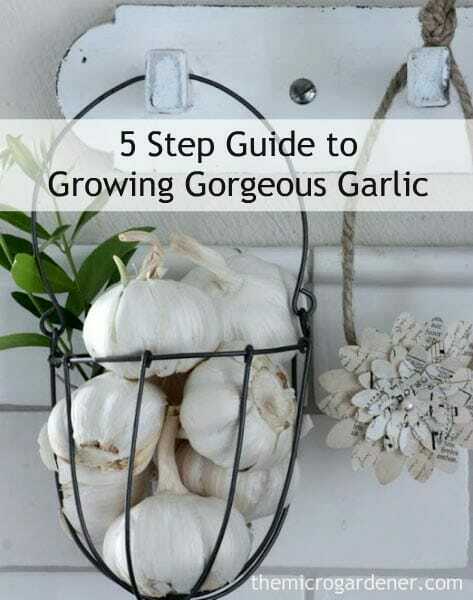 In Part 2, ‘Amazing Uses for Garlic in Your Home & Garden’ I share some of the wonderful ways you can benefit from your gorgeous garlic – recipes, garden tips and for medicinal purposes. You might also enjoy Guide to Growing Spring Onions – both indoors and out! So have you tried to grow garlic before? What have your experiences been? According to Australian Garlic Producers, “In China, chemicals banned in Australia are still being used to grow garlic. Australia imports 95% of our garlic from China. Chinese garlic is gamma irradiated to prevent sprouting and is also sprayed with Maleic Hydrazide to extend shelf life. All imported garlic is fumigated with Methyl Bromide by AQIS on arrival in Australia.” – You decide if you want to eat garlic treated this way. Food Irradiation: The Untold Story. Download a free ‘Irradiation-free Food Guide’ produced by Food Irradiation Watch and learn more about how & why food is irradiated from their fact sheets. ‘Fresher and Smellier‘ – The Age article – Explains good reasons to ask where your garlic comes from. Methyl bromide toxicity report – PAN Pesticides Database. Please share and encourage your friends to join my newsletter for free exclusive insights, tips and all future articles. Plus bonus eBook gifts! Help! My niece accidentally mowed my entire garlic crop. 800 plants. I estimate that it had about 3 weeks to go before harvest. Should I dig it up now, or wait? I cannot see the stems, so it is a guessing game. Do you have any suggestions? Oops! That’s a shame. Well, the longer the garlic is in the soil, the better for bulb development, unless you’re going to experience heavy rain at harvest time. Let them mature as much as you can. Perhaps water in with liquid seaweed for a final boost of trace elements or a soluble fertiliser. This may help if you can get that done by the 2nd (assuming you’re in the US) because after that for a few days, we won’t be in a favourable moon cycle for more growth. You could give it a go anyway. I’d dig up a few bulbs to see where you’re at in terms of development. You may still get a decent harvest. Good luck. Thank you for the harvest moon tip. I have been growing garlic for the last 5 years and never realized the importance of harvesting moon, I guess that’s why it’s called a harvest moon. I will be paying more attention to the moon cycle. Thanks for your comment. Harvesting by the moon phase (i.e. at the ideal time for root crops or above ground plants to extend the harvest) is different from a “harvest moon.” You can read more about an annual harvest moon here if interested. Hello, thank you so much for your tips. I tried to grow garlic from a garlic clove as I saw in different videos. I grew the roots in water and waited weeks before to put it in earth. Months later (I don’t remember if it was 4 or 5) I took it out from the earth (lots of cloves grew around it) and let it dry 2 weeks. Then I started to cut it and noticed it doesn’t smell garlic at all, it has a raw smell. I guess I did something wrong during the process. My question is: Do you think is it still edible? I’ve never heard of anyone trying to grow garlic using that method. I just plant it in the soil at the right time of the month and it shoots straight away. I guess it was an interesting learning experience for you. I couldn’t say whether it’s still edible. You’ll have to use your best judgment on that one! I’d be worried if it doesn’t smell like garlic though. What’s the point in growing it if it has no flavour or aroma? Maybe try the traditional way next time. Good luck. Hi Anne, I planted 2 types of garlic – soft and hard neck. That’s the only way I know to discribe them, I live in the Parramatta area in NSW. I planted my garlic in mid April 2016. I water say 3 times a week and feed them with charlie carp every 3 weeks. My question is what are the new shoots coming up through the centre of most of my plants? Please see attached photos. Thanks for your help. Vince, in spring, hardneck garlic usually produces a scape or false seedhead on a long flower stalk. This may be the new growth you see. The scapes are edible stems. Most gardeners remove them once grown and they start to curl. This will allow the plant to put more energy into the bulb development. In spring, higher temperatures and longer days usually cause leaf growth to stop as bulbs develop. Ideally, stop watering when you see the first signs of garlic maturity (tops start yellowing or necks begin softening). Your garlic should be ready to harvest when the plant stems start to soften and they are partly dry. As a rough guide, harvest hardneck garlic when approx 1/3 – 1/2 the leaves are brown and wilted. Harvest softneck varieties when the bottom few leaves start dying off or the garlic falls over. If you’re not sure, pull out one bulb to test it is fully formed before harvesting the whole crop. Good luck. Hi Patrick, rust is common to the members of the Allium family. 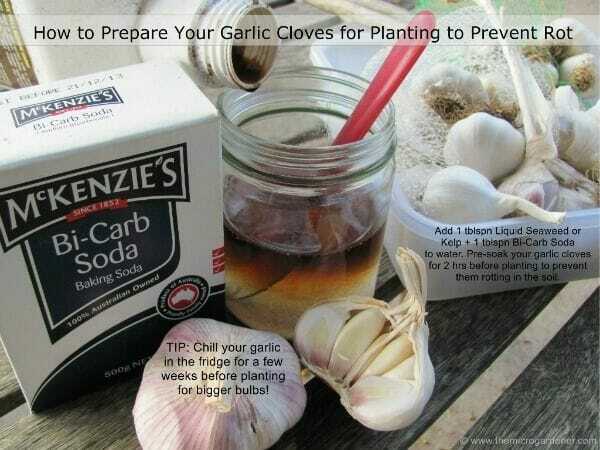 I suggest you try making your own potting mix and growing your garlic in a container. Then you can control both the soil and temperature/microclimate and can provide your crop with all the nutrients it needs. Try sourcing a variety from a supplier who has clean healthy garlic such as West Cork Garlic in Ireland. Remember to practice crop rotation i.e. don’t plant garlic in the same garden bed/pot as other members of the same Allium family (onions, leeks, shallots and chives). Good drainage and ventilation are also important. Hope this helps. I use a lot of garlic and would love to grow my own. I didn’t realize that what I was buying could have all those chemicals on it. 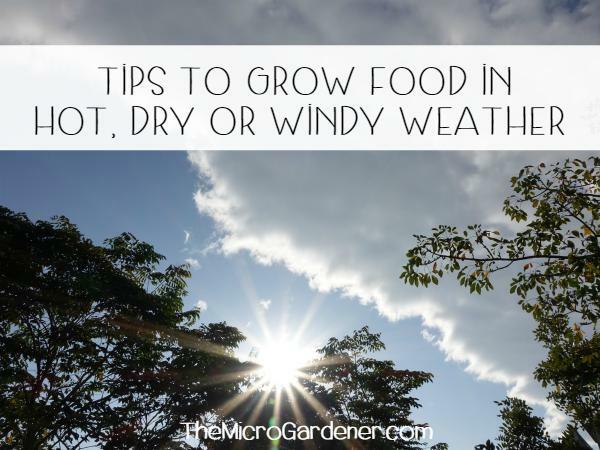 I like your tip to plan for a dry harvest period to avoid rotting. Is it possible to plant these in a planter box indoors if I have really cold winters? Thanks for all this great information. I can’t wait to try growing some! Hi April, thanks for your feedback on the article. Glad you’re finding it helpful. Yes you can sow garlic indoors. This plant likes the cold to develop bulbs. Keep it well mulched. Have fun planting and come back to let us know how you go! Hi and must say I am so pleased to find your site! I live aboard a yacht and everything in my “garden” is edible, including any flowers I grow. I love micro greens and make kefir and cheese and bread. You may like to have a look see at Farmhouse Direct’s website, where you can buy lots of farm fresh Aussie produce straight from the grower. I thought olive oil was olive oil till I bought from the grower and found out it has a great taste when bought fresh! No, I don’t work for the company, but I am a convert! Oranges are something super special when they come straight from the trees in South Aus and right to our door in Cooktown! The garlic I am growing also came from Aus and was originally bought from Farmhouse Direct. The most amazing thing is that most of the growers we have bought from so far have somehow ended up as friends, and we trade lots of recipes and ideas and information. Hope you have a look. Best wishes, Gay. PS if you have any advice on growing mint in Cooktown on a yacht – would appreciate your help! Hi Gay, wow a mobile garden onboard. How fabulous and inspiring! Would love you to email me some pics if you have time. I’d love to share your story with my subscribers. Cooktown has a tropical climate with hot, wet weather for much of the year. Mint thrives in moist surroundings and loves a semi-shaded spot so I’d recommend a suitable pot you can keep on board that is deep enough for its extensive root system. Ideally, a self-watering pot in a light colour so it doesn’t overheat and always has water. There are many that can be attached to railings if this suits your situation. Position it somewhere it gets some sun (dappled light is fine) and you’ll have a happy plant. Good luck! I never peel my cloves before planting as the papery layer outside helps protect the garlic clove from pests and diseases. However, don’t despair, your clove may still take root! Why not plant some more WITH the papery skin intact and compare results. Good luck. Good Afternoon, I loved all of your information about the garlic 🙂 Thank you so much! I was just wondering may I use regular seaweed for the soak? Hi Emily, I think you mean fresh seaweed? i.e. from the sea? If so, it depends on your environmental rules re collecting it (we are not allowed to here). Also, most seaweed contains high levels of salt so this needs to be removed by washing first. It’s easier to use a liquid or powdered seaweed product as these have been formulated for home gardeners. The choice is up to you! Enjoy planting your garlic. I have a small elevated garden to supplement our CSA and Farmer Market purchases – but never thought of planting garlic. I might have to try it next year. A small organic farm about 5 minutes from house grows the largest most flavorful garlic I’ve ever eaten. When I asked the farmer about curing the garlic, he said he loves it fresh out of the ground while it’s still juicy. I have to admit, don’t wait for it to cure too long. Garlic is phenomenal when the skins are still green. The essential oils just ooze out of the cloves. It’s addicting. Hi Ann, I have just retired and am about to start growing some herbs and vegs that I eat. This has been very inspirational reading all about growing garlic and I can’t wait to get started. I live in Hervey Bay, Queensland so great timing for me to get some in in Autumn. Thankyou for the info. Welcome Suzanne and happy to hear you’ve been inspired. Garlic chives grow well all year here in the subtropics so they are a good substitute in the same family in the meantime. Enjoy! Hi, thanks for the information. Please would u tell me your experience of media preparation procedures and proportions for pot planting of cloves. 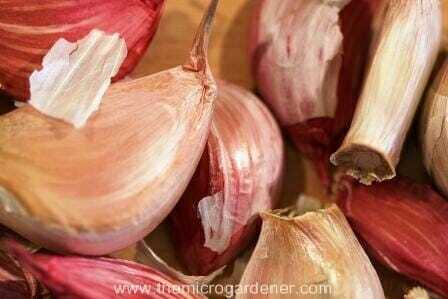 You can make your own potting mix if planting into containers and just follow the sowing instructions to bury the garlic cloves in Step 3 of this article. Thanks for sharing your experiences Chris. A great point about the plant putting its energy into the bulb. Same with tip pruning flowers off herbs so they continue growing more leaves. Please feel free to email me a pic to share. I’d love to see it. I live in Melbourne and have had my first attempt at growing garlic having been inspired by your site. I planted in early May and used plenty of mulch as suggested. There is almost no green showing on the stems above ground now so I have pulled a couple up but the bulbs seem quite small and have no papery covering. Should I leave them in the ground, do they have more growing to do? So great to hear you’ve given garlic growing a try. I am not sure what variety you planted so the timing varies – some garlic can grow in as little as 3 months – others take up to 8 months! Based on the timing you mention, it’s likely harvest time should be due around now though. Usually the larger bulb varieties take longer. This may be one of the reasons your bulbs are still small, however fertilizing, moisture and sunlight also play critical roles. 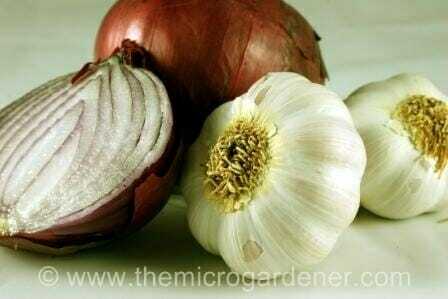 The bulb size at maturity can also be dependent on the size of the clove you started with. Small cloves = smaller bulbs. If you’re in a hurry to harvest before the wet season, just pull them up and enjoy them as they are now. Otherwise, add some seaweed/organic fertiliser to boost growth and check them in a couple of weeks to see how they’re going. Make notes of what you did so you can improve your harvest next season. I am assuming you followed the tutorial for a sunny position etc. The papery covering only occurs during the curing process after harvesting. Hope this helps! Would love to see photos when you harvest. Please feel free to email me or post on our Facebook page. Hi. I’m just wondering if you can help me grow plain old mint. I must be the only person in Australia or even the world that can’t grow it!!!!! I know it likes a damp shady spot. I bought some in an 8 inch pot a few weeks ago thinking I might be able to control it better “IF” it grows. While it is still alive it has only got very small leaves. I live in the colder part of Victoria and would like to keep it in a pot. I am determined to grow it somehow. I can’t be beaten by mint of all things!!!!! Even when I have had it grow for a little while, it still didn’t have the flavour that the English mint had or the really dark green leaves. Don’t feel too bad! We all have casualties in the garden. Based on your colder climate, it’s still early spring so healthy growth might take a little longer to happen for you. Remember all plants need some light to photosynthesize. If you keep the mint pot in full shade, this will slow growth. Dappled sunlight is perfect or even full sun if you have time to keep the water up. It needs to be constantly moist so a self-watering pot is ideal. To boost growth though, check what kind of soil mix you are growing it in. Dead dirt won’t grow healthy plants! 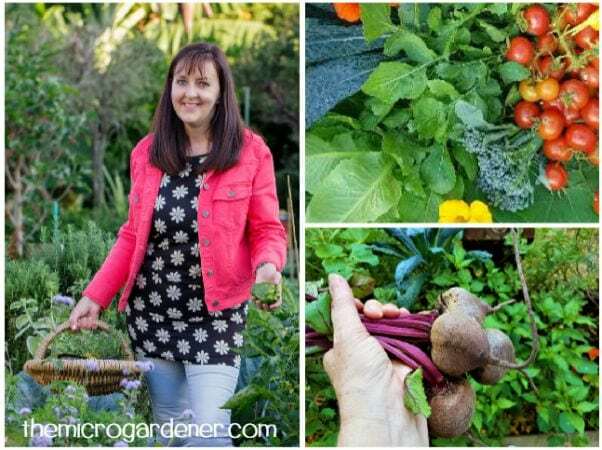 Take a look at my potting mix recipe – it’s full of moisture holding ingredients & gives you some tips on how to feed your plant. I’d use seaweed for the trace elements it provides – both to water in and also as a spray on the foliage. Mint also has an aggressive root system so give it a good sized pot so it can establish a healthy rootball. Remember roots grow before shoots! Hope this helps and let me know your progress. This informative and eye opening post has just been passed on to me. I have never had success growing garlic but am now determined to make it happen. I do buy organic, British grown garlic, but even so what goes on out of sight does not bear thinking about. May I please share a link to this page on my next blog entry later this week? 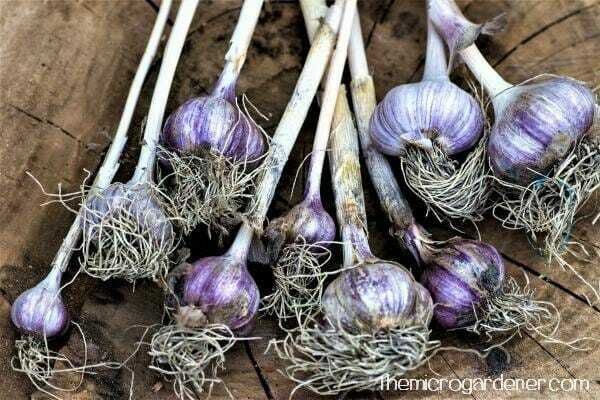 Feel free to share a link to my garlic article and please come back and share yours on this page too! Thank you so much for your information on garlic. We moved into our house 4 years ago and it has a hard neck garlic bed that comes back every year. I have a question, how does it do that? We pull the garlic every year and use it and to date we have never planted anything in it’s place, but it keeps coming back. We are going to add some more cloves to the ground this year to see if we can get more to grow. Just wondering if you know anything about how it keeps coming back??? it is all in a bunch, not in rows and we get about 30 bulbs of garlic every year. Hi Theresa is it possible to email me a photo of your garlic? You don’t mention where in the world you are located. True garlic ‘Allium Sativum’ has 2 sub-species – hard-neck and soft-neck but there are about 10 known varietal groups within these. There are also many allium varieties (onion family) including Egyptian or Walking onions, so it would be helpful to have an image to ID your variety. You may possibly find it easier to ID your variety with the hardneck descriptions found here. Hope this helps. Such a wonderful and complete guide ! I wish I could find such thoughout articles for every crop I wish to grow. Just wondering – is the newly harvested garlic edible, or does it really have to dry for a few weeks first ? I always heard that you get the most nutrients out of your veggies and fruits if you eat them as soon as possible once harvested. And indeed, even my local organic seller has them dried… I never saw fresh garlic ! Yes the newly harvested garlic IS edible! 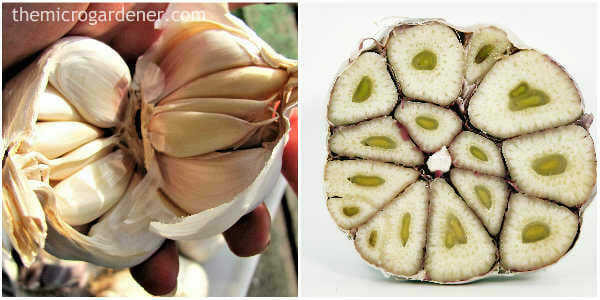 It is cured and dried so you can maximise the storage life of your garlic. Well cured, your garlic will last for months. If you don’t allow it to dry out, you will need to use it much faster! Thanks for a very indepth article about garlic. I never really thought about it as I am usually so busy trying select all the “bigger” produce organically. I did not know they irradiated the garlic or bought it from China. I thought it was a small item we must grow a ton of it in the U.S. Just goes to show you you have to look into everything. Thanks for doing the homework for us and showing us exact details to grow our own. Glad you found the article helpful Cathy. Just because garlic is small in size, doesn’t diminish its health benefits or the price! It’s definitely one to grow at home and allocate a small space to save money & improve your health. 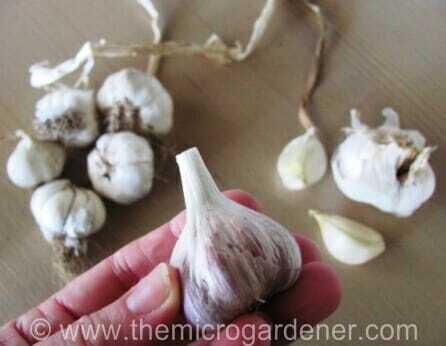 Thank you for your article – have not yet tried to grow garlic but really keen to start. I stay in Cape Town South Africa and we have a very wet rainy winter. I see that you start in Autumn – could I do that too – would the rainy weather not hinder the growth? When I buy garlic bulbs I peel them and store them in the fridge covered with olive oil – find that they keep well for a good month. I am in my second season growing garlic. I was so thrilled with the harvest…I tripled my planting for this year. I grew Chesnok Red, and the flavor is just outstanding. It stored well for 6-7 months. I live in the Midwest, and we had a terribly wet autumn. In fact, I wasn’t able to get into the garden to plant the garlic until the second week of Decemeber! Now…we have had the hardest winter on record for my area, snow, bitter cold….so….I’ve been hoping that all of those cloves I got into the ground have survived! I enjoyed reading through your article, and reading through the experiences of other people growing their own. Garlic will be a permanent part of my gardening from here on out..I love it! Thanks so much for your comment. I appreciated you sharing your experience and variety you’ve grown. It’s a help to others to know what grows well in their area. I hope your hard work will pay off come time for the ground to thaw! Please drop us a line and let us know how you go this season. If you are on Facebook, you’re welcome to come join our community page with thousands of other keen organic small space gardeners. We share lots of tips and inspiration there too and see pics of other people’s gardens. I sure appreciate your thoughtful advice. Thanks again! I live in Atlanta, GA. USA and want to plant garlic for the first time in containers. First off: Can I use bulbs from the braid I bought at the grocery store? Should I refrigerate them first? I want soft neck garlic to make my own braids. Hi Cyndee, you can give the bulbs you have a try and refrigerate first to pre-chill them although this step is optional. You don’t mention whether they are organic, local or imported so I am not sure whether they have been treated chemically or not. Perhaps this should be your first consideration? If they’ve been fumigated, try to source certified organic in your location from a reputable farm or retailer. All the best! Hello! Please help. I live in eastern Melbourne and I just harvested my first attempt at garlic. The green was turning brown and was limp, the stem looked a good size. Anyway the bulbs were tiny, barely bigger than the width of the stems. Bummed a bit but not defeated. Where do you think I may have gone wrong? They were cloves leftover from shop bought garlic. Good drainage, good soil. Yes the one closest to my peas was a pathetic skinny thing so have learnt that lesson. I don’t remember how many months ago I planted but it would have been autumn. Nothing looked rotted, etc. just anything in the soil was miniature! Thanks! 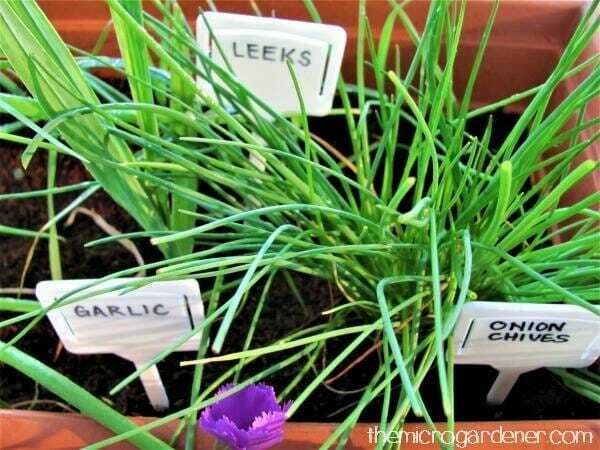 Congrats on having a go at growing your own garlic! I have to admit I never start with shop bought garlic – I only use certified organic so I know what I’m starting with so the variety and treatment may have something to do with your results. It sounds like the timing was right for planting/harvesting but you don’t mention anything about mulch? This is key to helping the garlic have a long cool period in the soil for the cloves to form. If you missed this step, try again with your next crop with a thick layer of mulch and you will likely have much more success. Good luck! This is THE most complete and comprehensive guide to garlic that I’ve seen yet! Well done! And thank you so much for sharing all of your research and hard work. You are a great inspiration. Great website, I really enjoyed it. I’m in north central Florida and have been growing garlic for the past several years but have a problem getting it to clove. The garlic is good but one solid bulb. Not that that is bad but would like to have cloves. Have any idea what might be going on? Soil pH is right where it should be and I continue to amend the soil so it is right about neutral (7.0). 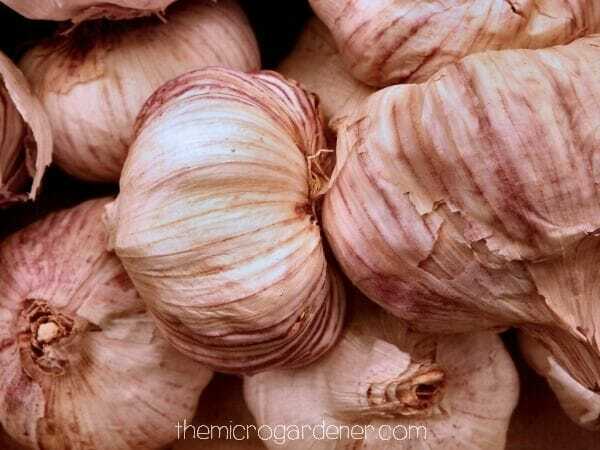 My seed source has been the super market but wonder if a good seed (clove) from a reputable garlic farmer would be a good source. Thanks so much for your feedback. I always start my crop with organic garlic NEVER from the supermarket. I just don’t trust it for a whole range of reasons and some garlic is sprayed with chemical treatments so it won’t sprout (i.e. so you have to keep buying garlic rather than growing your own). I want to grow LOCAL certified organic garlic so I invest in a variety of quality bulbs to get my own crop started from farmers I know personally. Depending on how many I plant, that may be $8-10 worth but if I’m saving around $80 then it’s a good investment. I choose a few varieties so I have some early and some late and can store over an extended period. – insufficient thick layer of mulch. Perhaps consider these factors? I hope this helps. Thanks for tip on growing around roses, I have a terrible problem with aphids on my roses. I am growing garlic for the first time and the one I grew is about ready to be harvested. Thank you for sharing! You can also eat the leaves， stir fry with meat or add in soup. Thanks Rika for sharing your tip with cooking garlic. 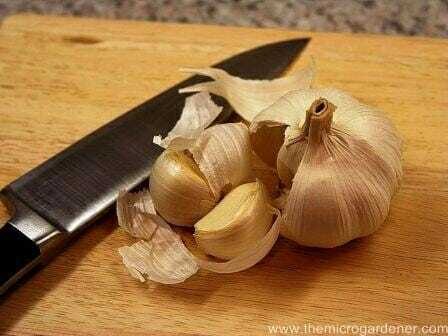 There are some more ways to enjoy using it in my article Amazing Uses for Garlic in Your Home & Garden. Hi! This is a great guide and has convinced me to make room for garlic in my veggie patch. My question is, do you harvest once for the whole year? How does that fit in with the 6-7 month storage life? Or do you plant and harvest twice a year? Thanks! Thanks for your question. Yes I plant and harvest twice a year. Have just planted both large and small bulb varieties that have long and short growth periods (respectively) so the harvest times are staggered. Garlic can be planted at different times during the year but does prefer some cool temps to mature so you may have to stagger your plantings according to your climate zone. Also try planting some in containers so you can move these in/out into more protected spaces if needed. I had to experiment a bit to work out which varieties are best for my climate so you may have to do the same. The reward of tasting AMAZING flavour and the health benefits of home grown garlic is truly worth it! 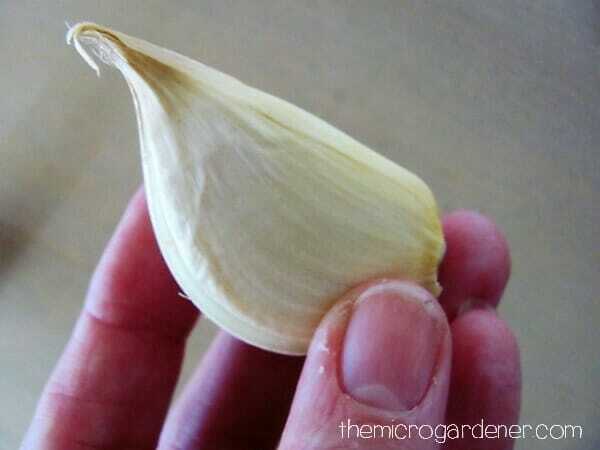 I’m sure you’ll notice an incredible difference when you taste your first clove as the flavour is quite intense compared to non-organic commercially grown garlic especially when you add nutrients to your soil. Hope this helps and enjoy the journey. Hi! Your website is sooo interesting. I am new to gardening but have tried my hand at tomatoes, and some herbs. My tomatoes didn’t do to bad. They did yield quite a lot. They where plum tomatoes. The herbs I grew last year (grown in pots) Oregano, Thyme, Basil, and Tarragon did real well. At the time I was living in a different state than I am in now and the soil was real good compared to where I live now. In a different state and the soil is mostly clay. But I now have the space to grow real garden. Going to purchase the moon calendar and will get a ph tester also. But anyway my question is the area I have picked for my garden, when I get it tilled up should I literally remove that soil and replace it with better dirt and nutrients or should I think of building something above ground and then just fill that in. If I need to replace the dirt how deep should I dig it out? Or is there a way to mix something in with the clay to make it a looser soil? Want to try to grow garlic also. 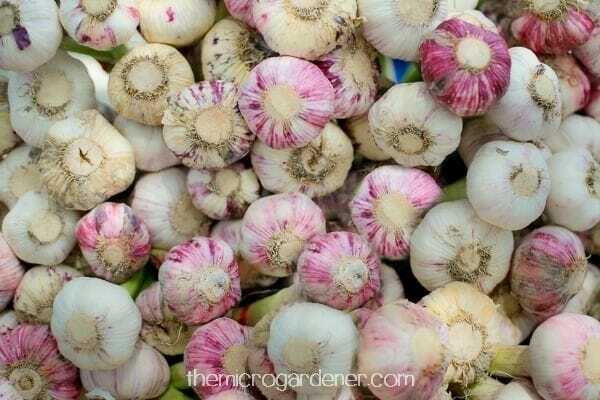 Read your article on growing garlic and really want to grow that. LOVE garlic. Thanks so much for your feedback and sharing your story with growing a vegie patch. I’ll try to help answer your questions. The quality of your soil is everything and the most important area to put your time and effort. It will repay you handsomely. I don’t “till” any ground, any time EVER. There’s a good reason for this (besides the fact I have a bad back and have limited time!) and that is it disturbs the microorganisms in the soil. The health of your soil depends on tiny fungi, bacteria and other creatures so I always build soil on top of what I already have. You can use a garden fork to aerate the soil and then build on top. One of the simplest ways to improve your clay soil is to add minerals (such as gypsum which helps break up clay soil but also needs calcium present so that’s why it’s good to have a balanced mineral mix) + organic matter – lots of whatever you have easy access to! 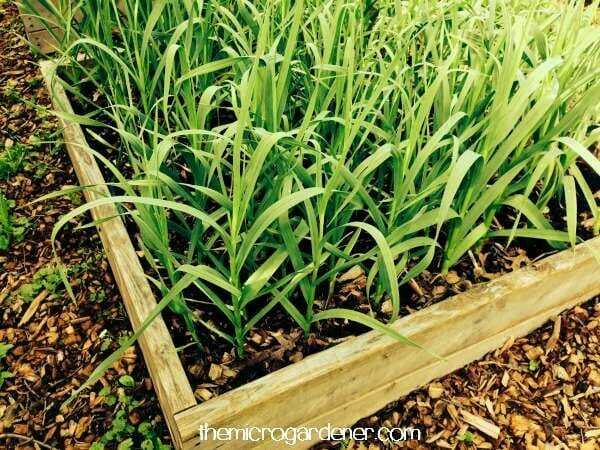 You can add this straight on the ground where you want to start growing or build a raised bed with sides. 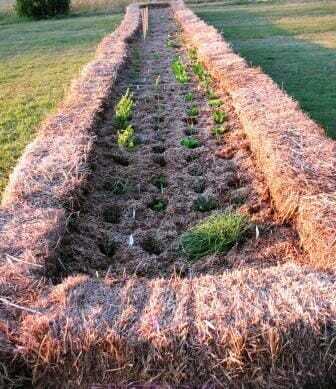 There are many options for making raised beds but one of the cheapest solutions that I’ve used is hay bales. Start with enough to make 2 long sides (e.g. 2 or 3 bales long) x 1 bale wide to form a rectangular bed. The bonus is you can ‘sit’ on the sides to garden/sow/tend. As they break down they are perfect to add to the top of the garden bed to replenish it and they are full of worms. Then I add fresh bales around the edges to start again. Every year the soil improves more and more. Here in the subtropics it takes about 9 months for the bales to break down due to the hot/wet weather and microbial action but colder climates they would last much longer. You can also cover the bales in weed mat with a staple gun to preserve them even longer. Once you have your outer bales in place in a rectangle, use stakes to hold them in place. Using another bale (or as many as you need), break it up into ‘biscuits’ about 3 inches thick and lay these on the ground inside the hay bale raised no dig ‘bed’. If you have grass/weeds, cover with wet cardboard or weed mat first to prevent these growing up into your bed. As the hay breaks down, it will add valuable organic matter to the soil and improve drainage. Then layer other organic materials (like a lasagne) on top of the hay layer alternating greens (nitrogen rich) e.g. grass clippings, prunings, vegetable scraps, fresh manures, blood & bone, etc with browns (carbon rich) e.g. leaf litter, compost, aged manures, saw dust, more hay etc. Finish with a carbon layer. I always add minerals and organic soil conditioners/fertilisers as I go, so as the layers break down into a rich humus and soil medium, your plants will have plenty of food to grow. Garlic doesn’t need such a great depth and I’ve planted these just into an 8 inch deep bed I made with hay and organic matter. They thrived! I really encourage you to give this a go. Here’s a pic of one of my beds I made using this method. I just found you! I am an experimental microgardener because I live in a townhouse. I’m so excited to learn more. I have subsribed just now and am looking forward to the book. Your site is fantastic and plan to return often. Thank you! Bonjour, je vie en France dans le Morbihan, je n’ai jamais cultiver d’ail, pouvez vous me dire si en Bretagne c’est possible, car le climat est humide ? Pas de problème Annick! Travaillez avec vos saisons pour trouver le meilleur moment pour planter. Commencez avec votre zone climatique. 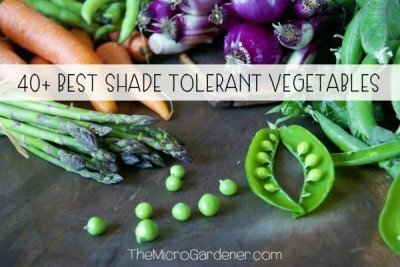 Vous pouvez utiliser http://www.gardenate.com comme un guide pour les bons moments pour planter l’ail et de nombreux autres légumes. En général, dans votre région, je crois Novembre et Février / Mars (maintenant!!) Est un bon moment car elle exige des températures froides de croître. Suivez mon guide pour les étapes. Bonne chance et amusez-vous. S’il vous plaît pardonnez mon français que je dois utiliser un traducteur pour vous aider! Hi Annie, I think the main reason why people are not eating more Aussie garlic is the very high price. How can garlic remain competitive when the cheap Chinese import is $2.50 for a bag and a single bulb of Aussie garlic is the same price in the supermarkets! I am in the process of growing stacks of garlic but can easily see why people ignore the Aussie stuff and head straight over to the cheap Chinese import or the jar (ech). That’s a very good question Fran. Aussie farmers do have higher labour costs so will never be able to compete price wise with cheap chemically grown Chinese imports. One good alternative is Jensen’s Crushed Organic Garlic – they are an Aussie brand that sell their products in jars at reasonable prices so perhaps this could be a good option for those without the space, time or skills. The other crushed garlic products I’m aware of in our supermarkets are either made in China or not organic. I’ve noticed at our local farmer’s markets that ‘Australian garlic’ is being sold now where it never was before (& at reasonable prices) although this too is being grown conventionally – with chemicals. Perhaps the message about Chinese garlic is starting to impact sales slowly. However, the average consumer doesn’t realise “Australian Garlic” is still grown with pesticides unless it is labelled Certified Organic. I’ve found in the kitchen when cooking with organic garlic (my own especially as I put so many minerals in the soil), that I use far less because the flavour is so intense. Perhaps the Chinese sell such big bags for so little because you need to use a lot of it due to the lack of flavour! Flavour is evidence that the crop has been grown with nutrients and the purpose of eating garlic is to get the health benefits – it’s false economy in my opinion to buy/eat cheap garlic for this reason. My eyes were bigger than my stomach! I bought a rather large tub of peeled cloves several months ago which I think should either be tossed or planted. My question is what should I do? If planted, how long til harvest? Well I say “waste not, want not”! You’ve got nothing to lose by trying to plant them! I’ve never bothered peeling my cloves however I know some home gardeners do – you can find the instructions on planting garlic cloves that are already peeled at Gourmet Garlic Gardens and also Daphne’s Dandelion blog. Harvest time will depend on the kind of garlic you are planting – since they’ve come in a tub I assume from a deli or supermarket, it will be a mystery until they sprout and grow! Follow the general guidelines in my article and you will know when they are ready. If they grow successfully, save some cloves for the following year’s crop. Then you will know how many months they will take. Thanks for all that info in reply to the post I made back in April. What do you know/advise on rust on Garlic & Leeks? On the allotment they have developed rust. We have had a very wet & cold June this year. I think the Garlic is about ready to lift as, like you mention the leaves are now dying back, as we are forecast a few days of warm, dry weather this week, do you think I could lift them now? I also tried digging around the base of one this morning but the soil is so wet I couldn’t get enough away from the bulb to determine if it might be ready. Does rust damage the cloves or only the leaves? The Leeks are producing big flower buds & have rust. Can they be dug up & used or should I pull them up & get rid of them? Which brings up another question: Can the rusty leaves be composted or should they be disposed off some other way? Thanks for your interesting newsletters! Thanks for asking these questions. Rust is one of those diseases that pops up from time to time in many gardens. I’ve had it appear on my shallots/green onions – also members of the Allium family. Rusts are caused by fungal spores that are carried and spread by the wind. Rust is quite difficult to control for this reason as these spores can spread to a wide area and other plants quite quickly. However each rust variety is usually limited to a specific host (such as the Allium family) so is unlikely to spread to other plants on the allotment. Moist, humid conditions create perfect growing conditions for rust. • Good Hygiene – To control the outbreak, promptly remove and destroy all infected plants. 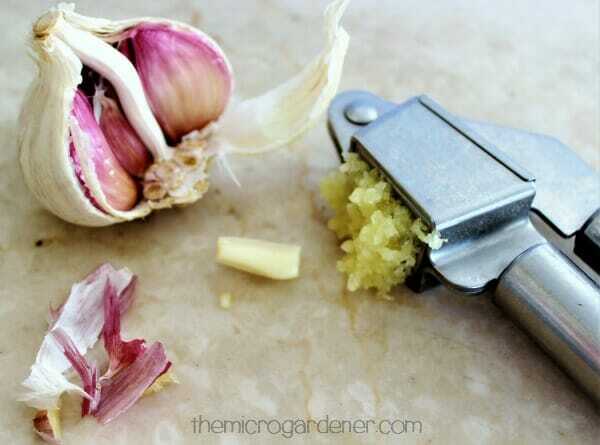 Save your garlic whatever stage of development it’s at (small cloves are better than nothing!) and make sure you bag and dispose of the infected plants rather than adding them to compost. Spores will stay in the soil for several years. • Be Observant & Act Fast – If you see any more infected leaves appearing, remove them immediately. Rust generally starts as spots on the upper leaf surface and underneath the leaf a powdery pustule appears. Eventually the spores growing inside the leaf will burst through the outer leaf layer and spread on the wind. So early intervention minimises damage. Pay attention to your hands and clothing/shoes that may have been in contact with the soil or plants and wash them too. 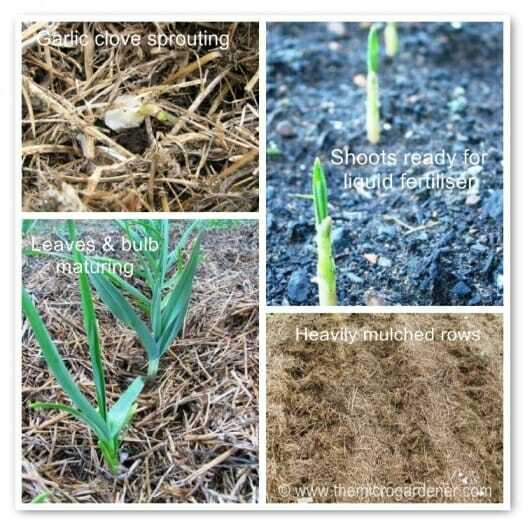 • Good Crop Rotation Practices – Because the surrounding soil likely contains dormant rust spores, avoid planting members of the Allium family in this area for 2-3 years. • Grow in Pots/Containers – Because you only have a small space, you could consider growing in fresh potting mix that has not been contaminated with the spores in container gardens. 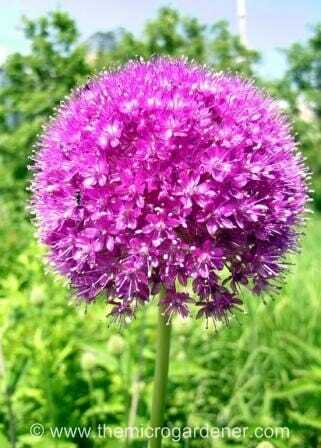 This still allows you to grow your Allium family without waiting such a long time. Build up that soil with a green manure crop and increase the humus level. • Minerals & Fertilisers – Avoid synthetic or chemical fertilisers – many are high in nitrogen which can make plants more susceptible to rust as they encourage lush growth. A balance of minerals, organic fertilisers and compost build plant immunity. Silica is important for cell wall strength so if you are adding an organic fertiliser, check the ingredients. Seaweed is also essential for soil and plant health as it provides many trace minerals. • Good Drainage – Check your garden beds to ensure water is able to drain away rather than build up and create a humid environment. Build your soil with ingredients that will create humus (worm castings, compost, manures, mulches and coconut fibre) to buffer too much moisture. • Correct Spacing – Make sure there is adequate air flow around the plants to avoid a build up of humid conditions that can favour fungal diseases. • Plant Selection – You may be able to find varieties that are somewhat resistant to rust. Ask your local suppliers. So happy to have found this post from a Pinterest pin! My garlic was a gift from a Korean friend about 7 years ago and with each new harvest I bless her more. You have provided great tips and information thank you! Read your post and it made me motivated to start growing my own garlic this season! Hoping to see your Facebook page soon! As I am from Asia which month would be suitable for growing garlic? Thanks for your comment and thrilled to hear you’ll be growing your own garlic. In mild climates you can grow garlic all year round (like I do here in the sub-tropics) but in cooler climates, it’s generally recommended to plant in autumn/fall. In any case, it’s best to give it a go. I’ve had my most exciting discoveries of what works and grows well in my local climate just by experimenting. Worst case, you’ll end up with garlic leaves to use in your stir fries and best case, you’ll be enjoying your own gorgeous garlic within a few months. Try checking the climate zones resources I have listed in my article What to Plant When – this might help you. Here’s a list of Asian hardiness zones. Great to hear from you and it seems – good timing! I am with you – nothing to lose by planting it and if it’s been refrigerated, even better! Worst case, you’ll end up with some delicious garlic green leaves to add to meals and best case, you’ll be enjoying the flavour and satisfaction of home grown gorgeous garlic. 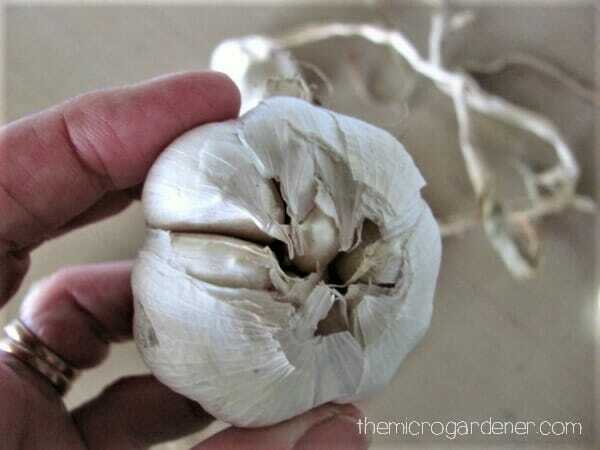 I’ve just posted Part 2 of this article, Amazing Uses for Garlic in Your Home & Garden. Dig in and enjoy! Do you have a facebook page? If you do, we can’t find it. 🙂 Thanks for your great site. Thanks so much for your interest and feedback. 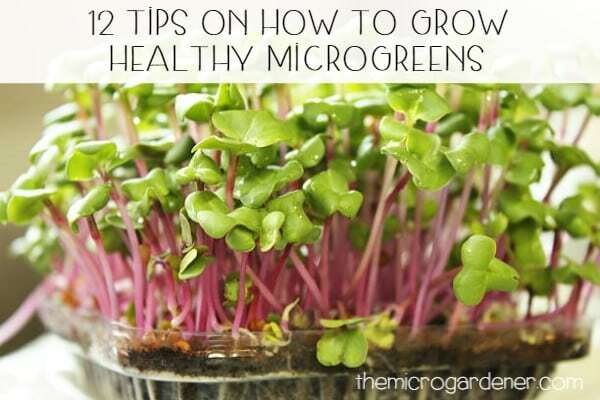 You can find me at http://www.facebook.com/TheMicroGardener. Thanks for the information on Garlic. I have planted mine in the allotment this week to grow through our Queensland winter. Jean. 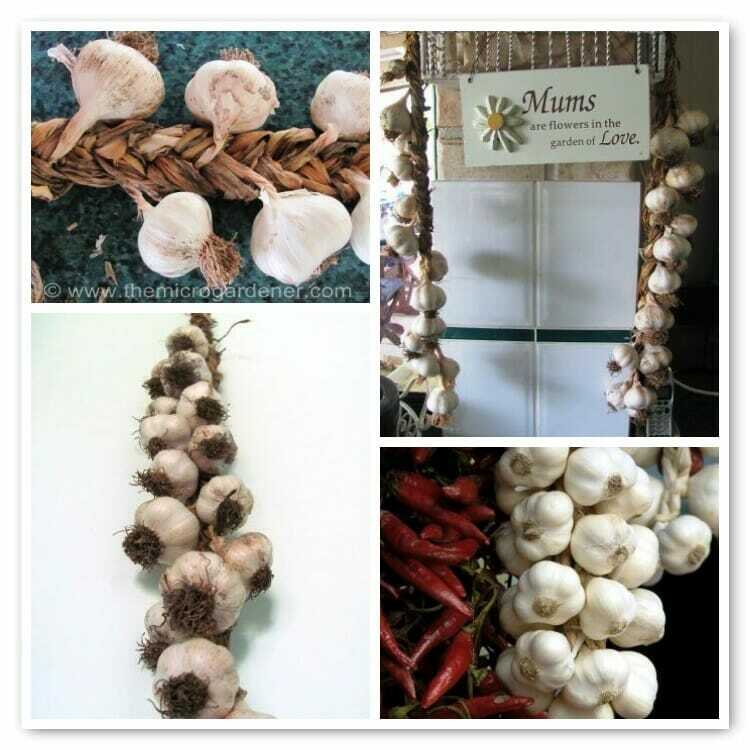 Hi Jean – so glad you found the info on garlic useful – just love this wonderful herb. 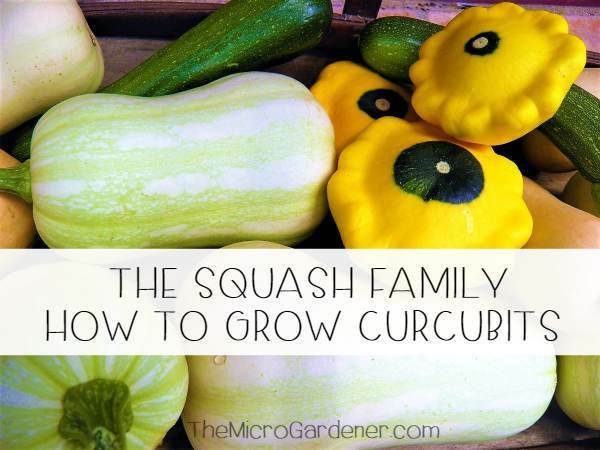 I popped over to your wonderful blog for a peek at what you’re growing. You sound like you love gardening in the Beelarong Community Garden – and you can always compost your corn crop! In fact chopped up it makes great mulch. I’ve been reading your email newsletters for some months now & I generally like what you write about, this latest about Garlic has been no exception! Even though I live in the UK I still find the subjects you write about interesting. I even posted a link to your site on my Facebook page. For the last couple of years I’ve been growing veg on an allotment. I’ve grown Garlic for two years but I can never seem to find two people on the allotments that agree on how you should treat them! So reading your article has been a great help. You may be entering the autumn & we the spring but the problem remains the same – & for me it’s a constant with a lot of the veg I grow, & that is WHEN do you harvest them? I’ve been used to growing flowering plants for the better part of 50 years &, other than tomatoes, haven’t grown veg up until 3 years ago. I find your newsletters “down to earth”, if you’ll pardon the expression! Hi David – thanks so much for your lovely feedback … much appreciated and for posting a link on your Facebook site! I know a number of subscribers in exactly your position who also garden in the UK on allotments. I have a few suggestions for you that I hope will help. Firstly, the most important factor for harvesting is to know which variety of garlic (or any fruit/veggie/herb) you are growing and days to maturity. You can find this information from the grower you buy from or online catalogue. If you know the maturity date, you can work out the approximate harvest date on your calendar from time of planting (I use a wonderful free online tool to record these dates called MyFolia and thoroughly recommend you check it out – free to join). It’s a great source of knowledge and you can locate other gardeners in your local area who may be able to give you specific advice on your local variety and timing. There are loads of groups including Garlic, Onions & Chives where there are numerous discussions on various aspects of growing the allium family. You can also find a helpful list of Garlic Varieties and information on growing them on the MyFolia site. Secondly, as I mentioned in the article, look at the physical plant and what it is ‘telling’ you around the expected harvest date. By this I mean, learning to ‘read’ your plant’s ‘language’. All plants communicate – mainly through their leaves – so once you know what you’re looking for, you can interpret the signs. If you are growing hard neck varieties, the flower (scape) will usually appear about a month before harvesting and the dying off of leaves is the plant’s way of telling you it’s nearing time. Inspecting the bulbs by brushing dirt away and checking if the cloves have formed is another way you can determine how soon to harvest. You can harvest before the ideal maturity date if you really need to but ideal timing for longer storage is fully mature garlic. Hope this helps and please let me know if you need more info David. So glad to hear you are already on your garlic growing journey. Good on you! These issues regarding safe garlic are only the tip of the iceberg sadly in terms of what’s going on with our food. Genetically modified seeds, chemicals and additives, food miles, pesticides and herbicides, long term storage resulting in minimal nutrient value and out-of-season produce in stores … I could stand on my soapbox all day as I’m passionate about educating people about what we’re really eating. My research has resulted in some eye opening truths and I hope to continue to share what I’ve learned here. Making small changes can make a big difference to our personal health and also send a message to companies that we want safe local fresh food to eat or we won’t buy it from them. I wrote another article relating to this subject about How to Shop Sustainably that you might enjoy reading too. How timely. I only planted some garlic yesterday and was thinking to myself I must research this some more and what do I find in my inbox this morning – your latest post! This is great info and just what I was after. Thank you!!! You have inspired me to grow garlic again. I buy many cloves at the farmer’s market in the summer and early fall but they don’t last and the idea of buying Chinese-grown garlic is very, very unappealing after reading your article. Thanks for the tips. I do try to grow some with my roses. Hi Therese – so glad to hear this and thanks so much for sharing your experiences! When I learned about how the majority of garlic is grown commercially and treated before it was making it to my table, I knew I had to change my buying habits. So ‘bad’ news can sometimes be the catalyst for a much better outcome and force us to eat more healthily. I am sure when you compare the flavour of your own garlic to what you have been buying, you’ll never swap back! By the way, if you have access to lucerne/alfalfa (even tea bags or sprouts but ideally mulch), roses do extremely well by being watered/mulched with it. I learned this tip from some rose growers while we were flower farming. All the best.